School zoning in Victoria is simple yet can be complicated at the same time. In summary, the school zone or the official name Designated Neighbourhood Zone for Victorian schools are generally whatever closest to the student’s home. The exception between metro and rural area is that in the metro area this is defined by distance as the crow flies. In the rural area, it is defined as whatever closest travelling distance school to student’s home. Only Melbourne metropolitan region, Ballarat, Bendigo and Geelong are considered as the metro area for this purpose. Also in some specific circumstances, Victorian Department of Education and Training have designed a number of Primary and Secondary school with specifically designated neighbourhood zone. If this is the case, it will no longer follow the closest distance rule anymore. What this means is that even if you live opposite to a particular school, if student’s home does not fall into the specifically designated neighbourhood zone then he or she may not be accepted into the school in question. What adds to the complication is that in Victoria, Public Schools have a large mix of year range. In NSW, it is generally Kindergarten to Year 6, plus Year 7 to 12 for Public Schools. There is a few exception of infant schools going from Kindergarten to Year 3, Junior High Schools from Year 7 to 10 and Senior High Schools from Year 11 to 12. However, schools like these are relatively rare, for example in Sydney there are only a handful of Senior schools going from Year 11 to 12 compare to the hundreds of regular ones from Year 7 to 12. Also, Kindergarten in NSW is equivalent of Preschool in Victoria which refers to the first year of primary education that starts before Year One. Now you see why it is a major pain in the rear for someone to create school zone maps for Victora, it is major work just to sort out the year range and group them. The official Victorian government blog entry can be found here. As in all cases with Victoria School Zones, for final confirmation, you should contact the school in question. Most of the schools will have some spare spaces so out of area application is very viable for most of the schools and worth a try if there are specific schools students want to attend but their own fall outside of its school zone. I have recently published a bunch of school zone maps in Australia for all the states that I had been working for a while. There is one last bit, which is Western Australia that still to come the first version should come very soon. I am also working on fill out rest of Australia’s school zone map, as there are a lot of missing parts still. Hopefully a lot of these will become available soon, I said same thing about last few sets such as South Australia School zone maps which I had actually worked on it for close to two years. Anyhow enough mumbling and I am sure the next few major update will come much sooner than before. Despite lack of the more visible updates, I have been furiously working on update many of the school zoning maps all over Australia. There a lot of updates will soon come. I also will try to provide a complete public school coverage at both primary and secondary level for NSW, this will likely be my primary focus after the current batch of projects got done. I am hoping as well to have near Australian wide coverage of school zoning map in the near future at least at the primary level. Anyhow each talking and hope your guys had a good first school week. I hit a major barrier on my quest to map the Australian schools. I been working on this problem for last two weeks and have been bashing my head against a wall for not much return to show for the efforts. I did make better progress in last two days and hopefully will be nearing the solution that I have with mapping the Australian school catchments. So fingers crossed for the better news in the near future. Which state is the next? 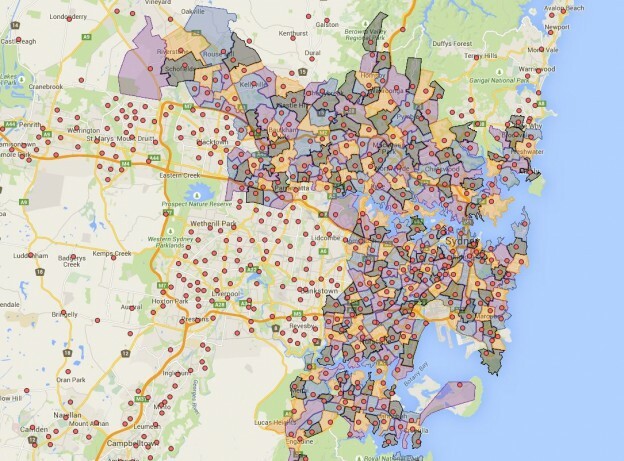 Now that ACT school catchment has been completely mapped. I am considering which state to move onto next. I have actually done considerable work for just about all states already and it is really a matter of expanding the work and making them public at this stage. With number of things happening right now, I am having to ration my time somewhat and unable to devote full time to the school catchment mapping project. I most likely will pick a state out of Western Australian, Victoria or South Australia to focus my energy on. I am enjoy the experience and hopefully your guys found the work done useful as well. Author adminPosted on 2016-08-21 Categories General Education, General MappingLeave a comment on Which state is the next?